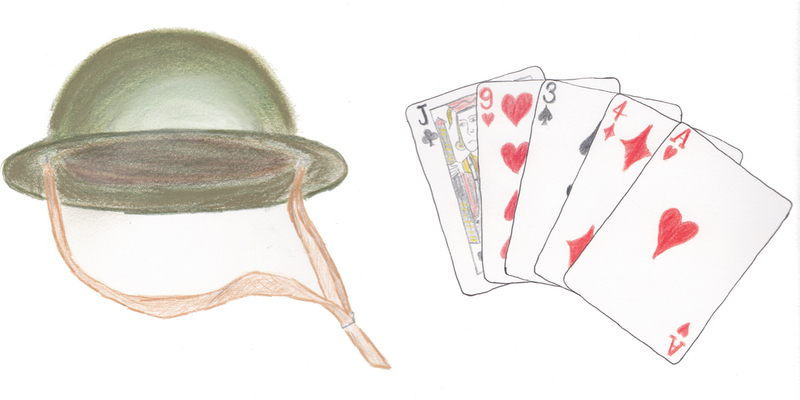 The idea for this week is a game set in the trenches of World War I. This is a game where you must match patience with quick reflexes. Play cards while waiting and then leap into action to stop the invaders from reaching your trenches. This game combines quick responses with waiting and the tension that waiting can bring when you do not know when you need to jump back into action. Many games exploit quick response times, but often require constant quick responses which reduces the initial fear/excitement of jumping into action from nothing. It is World War I and you are stuck in the trenches with your fellow soldiers. Part of the time you are bored, waiting for action, the other part of the time you are desperately fighting for your life where you are given few chances and the wrong move could kill you or your mates. When you are fighting, the enemy can be seen coming towards you over the top of the trenches. If you act well, the enemy will be forced to fall back, if not, the enemy will get a lucky shot and kill you, or advance and overwhelm your position. In The Trenches has two main gameplay phases. In the waiting phase, the player is simply watching a card game and not actually doing anything. The game will switch suddenly into the action phase. In this phase the player is shown a key to press or a mouse movement to execute and must do so within a short period of time. If they fail a certain number of times, then their character will die and the game will be over. In the action phase the player is dodging bullets and needs to press specific keys (e.g. the "b" key, or a number). They will also be required to switch to using the mouse to draw a simple movement every so often. This style of gameplay is similar to the fight sequences in "Heavy Rain", where players do not know which button they will need to press on their controller next, and only a small number of wrong moves can lead to serious consquences. The key here is the difference between the two phases. The waiting phase is practically boring, but can end at any moment so the player must be ready to jump to action. In the action phase, the player is not given many chances and the consequences of failure are sudden and significant. Making sure the correct balance between boredom and action will be essential. Likewise, making the action phase difficult, but not excessively so will be important.